In order to determine 11th place onwards, and seasons totals for both weight & fish numbers, all data from ledger re-entered into an Excel spreadsheet 12th - 15th March 2014. Singles Knockout runner up - Neil Inglis. Doubles Knockout winners - Norman Brittain & Andy Smith. Doubles Knockout runners up - Richard Webb & Neil Inglis. Open Five winner - Ian Russell. 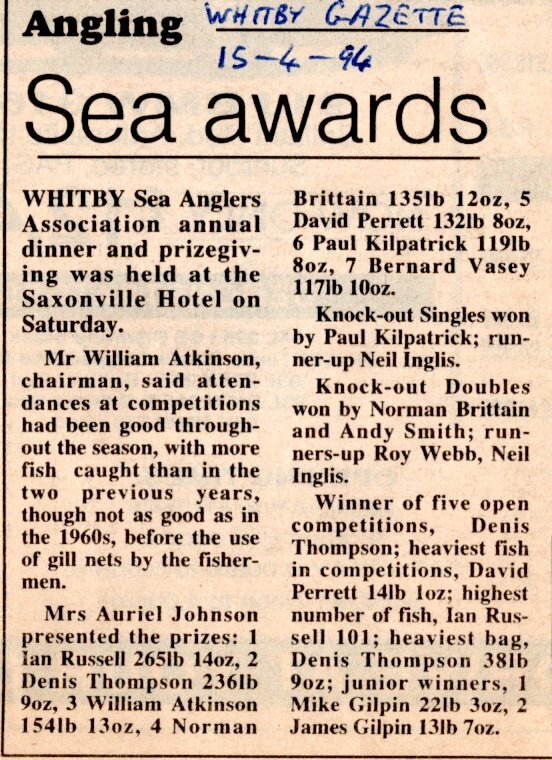 Heaviest Fish in competition - Dave Perrett - 14 lb 01 oz - Sunday 31st October 1993. Heaviest Fish out of competition - Paul Kilpatrick - 9 lb 01 oz - between 2nd & 6th March 1994. Christmas Match winner - William Atkinson - 14 lb 10 oz. Greatest Number of fish - Ian Russell - 101 fish. 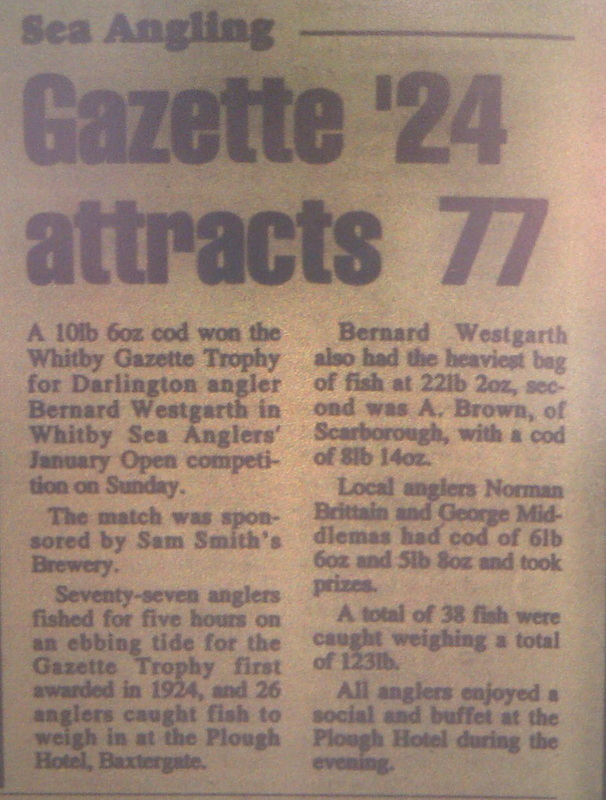 Heaviest Bag of Fish in competition (WSAA Open Sun 28th Nov 1993) - Denis Thompson - 38 lb 09 oz - 5 fish. 3rd - Paul Nelson - 7 lb 05 oz. ** all data from ledger re-entered into an Excel spreadsheet 12th - 15th March 2014. Whitby B - Runners Up South Section. 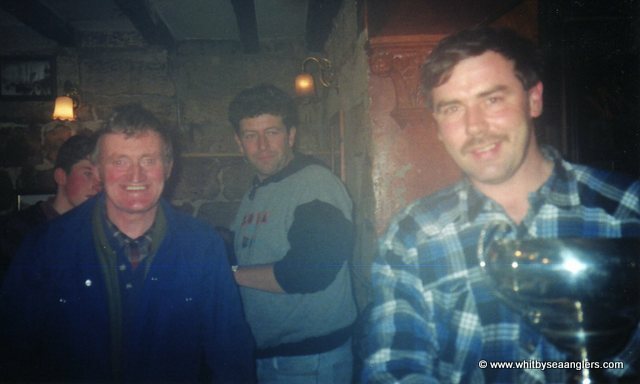 Paul Kilpatrick, George Middlemas, Neil Inglis & Paddy Hoy - 31st March 1994. 3rd October 1993 - George Middlemas Heaviest bag of Fish - 15 lb 14 oz - 4 fish. 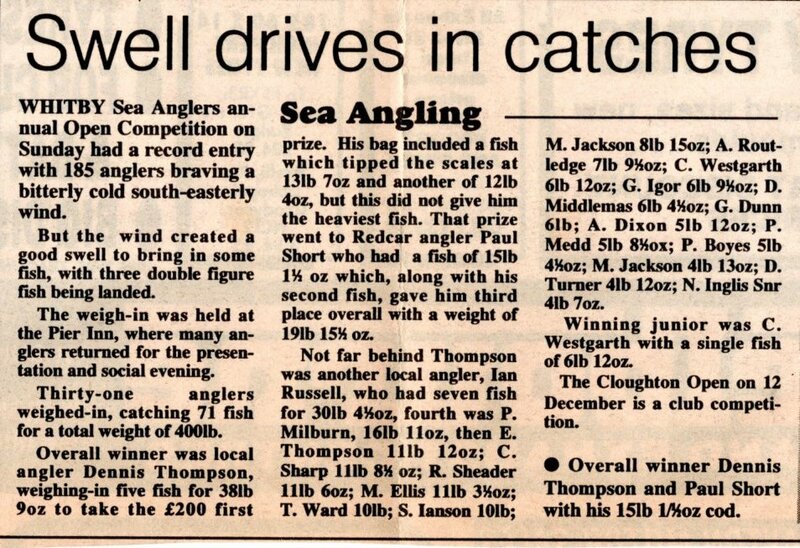 13th October 1993 - Ian Russell Heaviest Bag of Fish - 23 lb 13 oz - 10 fish. 24th October 1993 - Ian Russell Heaviest Bag of Fish - 24 lb 02 oz - 8 fish. 31st October 1993 - Dave Perrett Heaviest Fish - 14 lb 01 oz, part of a 21 lb 14 oz bag - 4 fish. 28th November 1993 - Denis Thompson Heaviest Bag of Fish - 38 lb 09 oz - 5 fish. 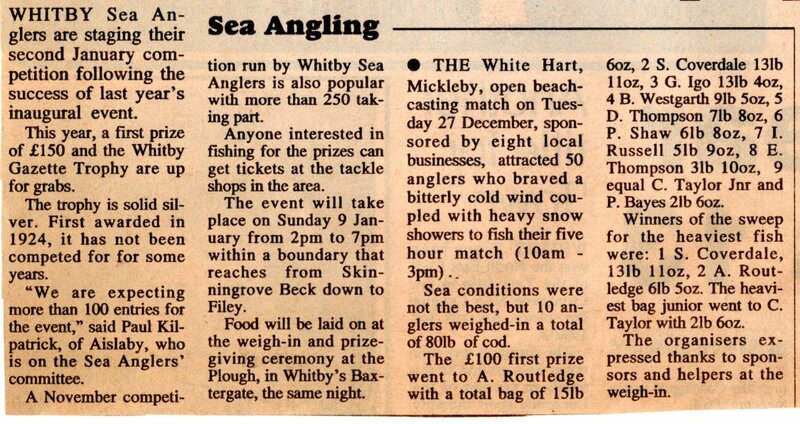 Between 5th - 8th December 1993 - Paul Kilpatrick Heaviest Fish out of competition - 8 lb 08 oz. 15th December 1993 - Bernard Vasey Heaviest Fish - 9 lb 13 oz, part of a 16 lb 04 oz bag of 3 fish. Leader board at the end of October after 10 matches. Total weigh-in 371 fish for 778 lb 04 oz. 27 members entered and 11 members weighed in. 38 lb 09 oz - 5 fish. 30 lb 05 oz - 7 fish. 6 lb 05 oz - 2 fish. 4 lb 07 oz - 1 fish. 3 lb 02 oz - 1 fish. 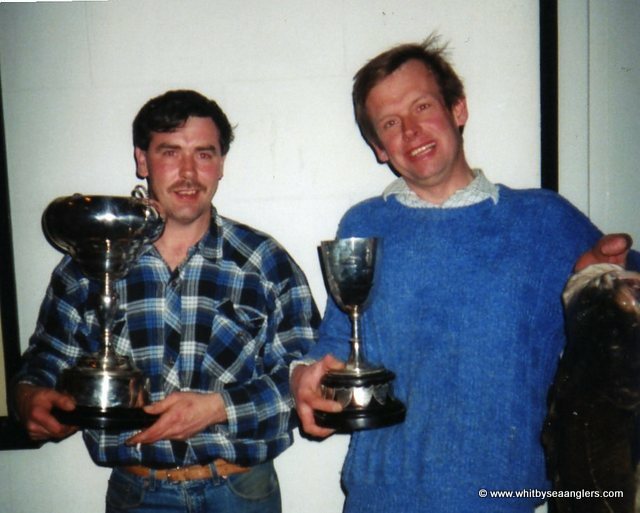 Denis Thompson 1993 Open Winner 38 lb 09 oz, and Paul Short, Heaviest Fish sweep winner - 15 lb 00½ oz. Photograph by Bernard Vasey. 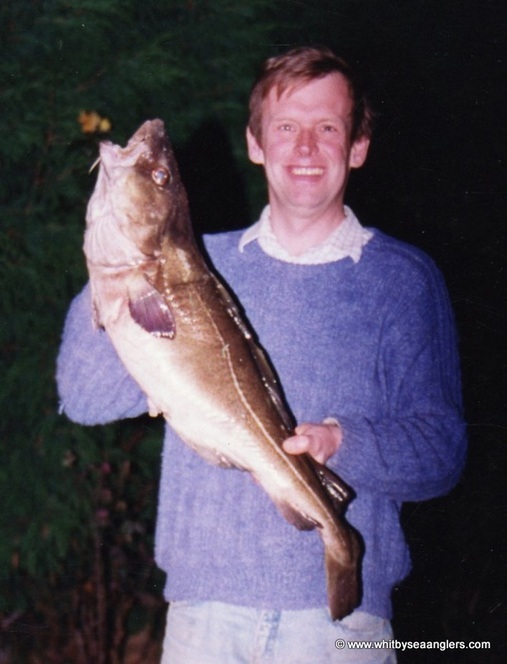 Paul Short, heaviest fish 15 lb 00½ oz, 1993 photographed in his back garden by his wife. William Atkinson and Denis Thompson, 1993. Photograph by Bernard Vasey. 30 members entered and 7 members weighed in. Leader board at the end of November after 18 matches. Total weigh-in 581 fish for 1,257 lb 10 oz. 24 members entered and 6 members weighed in. 8 lb 08 oz - 2 fish. 7 lb 10 oz - 2 fish. 4 lb 10 oz - 3 fish. 3 lb 07 oz - 2 fish. 28 members entered and 10 members weighed in. 6 lb 08 oz - 2 fish. 4 lb 10 oz - 4 fish. Leader board at the end of December after 25 matches. Total weigh-in 685 fish for 1,529 lb 06 oz. The White Hart, Mickleby, open beach casting match on Tuesday 27th December , sponsored by eight local businesses, attracted 50 anglers who braved a bitterly cold wind coupled with heavy snow showers to fish their five hour match (10am - 3pm). Sea conditions were not best, but 10 anglers weighed-in a total of 80 lb of cod. The £100 first prize went to Andy Routledge with a total bag of 15 lb 06 oz. The organisers expressed thanks to sponsors and helpers at the weigh-in. 21 members entered and 10 members weighed in. Leader board at the end of January after 33 matches. Total weigh-in 786 fish for 1,799 lb 14 oz. Leader board at the end of February after matches. Total weigh-in 867 fish for 1,995 lb 10 oz. Leader board at the end of March after 50 matches. Total weigh-in 935 fish for 2,143 lb 05 oz.